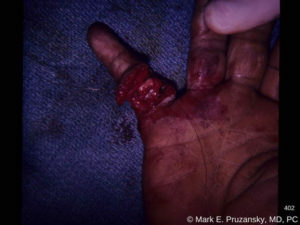 A Laceration is an open wound, often in the hand. The depth of the wound can greatly vary. Some laceration don’t completely penetrate through the full thickness of the skin, while others will. Even deeper lacerations will cut through the skin and the structures under the skin, which may include muscles, tendons, ligaments, bones, nerves, or blood vessels. 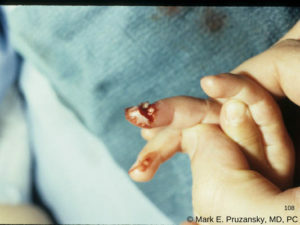 A wound, which may ooze or bleed briskly, is visible. Pain is common. Depending on the depth or the wound and its location on the hand or other parts of the upper extremity, there may be difficultly with moving a nearby joint or diminished sensation in the area. A variety of sharp and dull objects can cause a Laceration. In addition, extreme deformation of joint can tear its overlying skin. 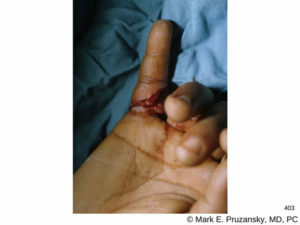 Speaking with you to understand what caused the Laceration and when it occurred are essential. A careful physical exam is important to assess the depth of the wound and check for important structures which might be injured as well, like nerves, tendons, and blood vessels. Immediate attention is needed and treatment may vary depending on the depth of the wound. If just the skin is cut, this wound can be treated with cleaning and suturing of the skin when appropriate. Antibiotics may be prescribed for a few days to minimize the chance of infection. If the laceration was caused by something metal or possibly contaminated it is essential to assess your tetanus vaccine history and administer a tetanus booster if needed. Deep lacerations with injury to tendons, ligaments, bones, nerves, or blood vessels indicate the need for surgical repair. State-of-the-art techniques, including microsurgery, are used to repair nerves, tendons and blood vessels. Any injured ligaments, bones and joints are also addressed. Rapid rehabilitation regimens are employed with or without surgical treatment. 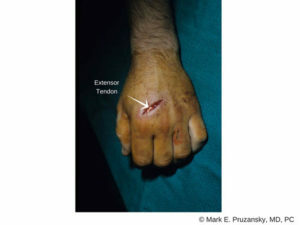 If you’re suffering from a laceration, call HandSport surgery institute today at 212-249-8700.